Sweden-based Applied Nano Surfaces (ANS) launched a new product, Tricolit GO, one of the first graphene-enhanced low-friction coatings on the market today. Tricolit is available now from ANS, in easy-to-apply spray cans or in bulk. The product can be used to reduce friction and wear. ANS claims that the use of graphene allows a tenfold increase in the coating’s mechanical strength and abrasion-resistance. We have talked to ANS CTO, Boris Zhmud, and he revealed that ANS uses graphene dispersions from UK-based Applied Graphene Materials. Tricolit GO is still considered an "experimental" product. The development was financed by Sweden's SIO-Grafen. 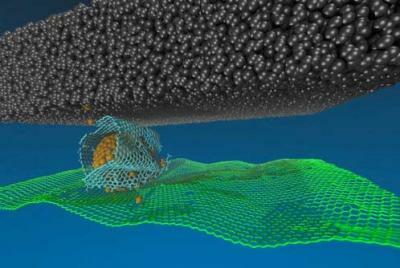 Researchers at the U.S. Department of Energy’s (DOE) Argonne National Laboratory have been working replace oil with solid lubricants such as graphene. Argonne’s Laboratory Directed Research and Development (LDRD) Program supplied the seed money needed to begin experimentation towards that end. This work may have far reaching implications both inside and outside the automobile industry. It could help wind turbines move with greater ease, allowing them to produce more energy. It also can better seal off machinery as it pumps oil or gas from the ground or out at sea. Graphene can also be used to better protect ball bearings, which can corrode over time when exposed to water, a process commonly referred to as tribo-corrosion. The Argonne-developed process based on graphene has shown that a few layers of graphene not only reduced friction in steel rubbing against steel by seven times and the wear by 10,000 times but also significantly reduced the tribo-corrosion problem. A new initiative called "The Technical Standards Development and Application Demonstration Base of Graphene-Modified Lubricants" was launched at LiuGong’s Global R&D Center in Liuzhou, China. Co-built by the China Innovation Alliance of the Graphene Industry and Guangxi Liugong Machinery (a leading China-based construction equipment manufacturer), it aims to become a major base in China that concentrates on the transformation of graphene’s scientific research into real world applications. The partnership also includes building a joint laboratory and undertaking independent test tasks from other companies in the future. The initiative will push the R&D and innovation of graphene-modified lubricant products at LiuGong and will also give the firm a chance to participate in drafting industry standards directly. Researchers at Sunway University in Malaysia have developed and produced graphene-based lubricants to improve automotive and industrial lubricants. They aim to commercialize their graphene-based nanolubricant 'Infinoil' within the year, which can reduce friction and wear, improving engine efficiency in automotive and industrial applications. "Wear of engines and machinery continues to be a global concern costing billions annually. Traditional lubricants which use chemical additives have reached the threshold limit in-terms of efficiency. To meet the modern engineering lubrication challenges which primarily deal with nanoscale-friction and thermal performance, we took up nanomaterials to find a solution. Having successfully exploited metallic, metal oxides, graphene and other 2-dimensional materials for heat transfer applications since 2007, our current focus is on heat transfer fluids which also include nanolubricants," said the researchers. The Wuxi Graphene Industry Development & Demonstration Zone (in Wuxi, China - near Shanghai) is an impressive graphene center (we visited Wuxi in 2017). The center recently renovated its demonstration room, and sent us this video showcasing the many graphene products and materials under development or in production at the center. There are a few new graphene projects underway at Wuxi. One example is a graphene additive to engine lubrication oils, used in the Xichuang G6 graphene oil, which is able to reduce gasoline consumption by 5-15% compared to current oils.